Getting a tire replaced on your car is a relatively simple procedure that doesn’t take very long. That’s the good news. 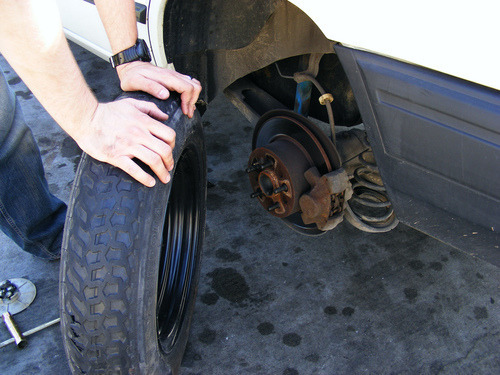 The bad news is that it can be a costly proposition – tires are among the priciest car repairs. But cheer up! This isn’t always the case, the cost to replace a tire really depends on what kind of car you drive. Tire prices can vary wildly. For example, if you drive a compact commuter car, the cost to replace a tire shouldn’t be any more than $50. But if you drive a jacked-up four-wheeler and require off road tires, or if you’ve got yourself a fancy sports car that can stop on a dime and take hairpin turns at high speeds with no trouble, you’re probably going to shell out a lot more than $50 on a single tire. The most expensive tires we could find, at a quick search, were for the Bugatti Veyron supercar, and those were $40,000! Depending on what your manufacturer recommends, the cost to replace a tire could end up being a couple hundred dollars. A cursory search for a few vehicles gives us this range of prices – note this is approximate cost range per tire, and this is only an estimate for the tire itself – not the installation. Know Before You Shop: What Size Tire Do You Need? You can’t just walk into a store and order any old tire. You’ll need to know the specific size for your vehicle. Find your tire size by heading out to your car, then look at your tire. Booking your local tire replacement online? 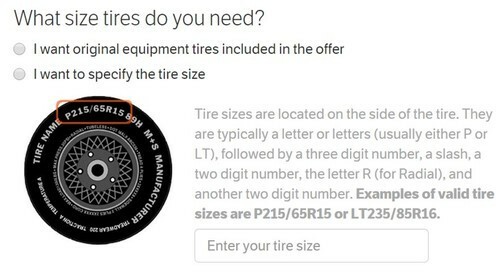 Here’s Openbay’s guide to determine which tire size you’ll need. On the side of the tire, there’s a combination of letters and numbers, usually beginning with a P or an LT. It might look like P215/65R15. Write down that size, or better yet, use your smart phone to snap a photo. That way, nothing will be lost in translation when you go online to buy new tires. Can You Get Away with Replacing Your Expensive Tire with a Really Cheap Tire? If money is an issue, then the thought that’s probably going through your head is “Can I get away by installing one of those cheapies?” The answer is: only if that’s what you’re already driving on. Different tire-tread depths can negatively affect your handling. You should never change tire sizes without changing out all four, for the same reason. You can’t just throw any old tire onto your rim. Rims are designed for certain vehicles, and those rims are designed for certain sizes and kinds of tires. Trying to install a monster truck tire onto your Ford Fiesta, for example, would never work. Likewise, trying out a small tire on your sports car won’t work either. When you’re looking for a repair shop to replace your tire, it pays to comparison shop, so you’re an informed consumer. Compare installation costs, as well as actual tire price, as this can drive up the total cost to replace a tire quite a bit. When you’re given a price, ask if it includes a road-hazard warranty, future flat repair, and rotation and balance service. Basic Tire Info – think of this as a “What are tires and why should I care?” rundown. Image credits: Kevin Dooley (top), Mike Petrucci (middle), Flickr. Next time you need some maintenance on your vehicle, think of Openbay! This entry was posted in Repair Services and tagged advice, apps, cars, cheap, cost, mechanic, MKDS, money, openbay, personal finance, save, save money, technology, tire, tire cost, tires. Bookmark the permalink.